3.1 Blessed One, if you think discernment is superior to decisive action, why do you insist that I carry out this destructive act, inquired Arjuna. 3.2 Your speech is ambiguous and clouds my reason—please tell me the best way that will guarantee my spiritual salvation? 3.3 The Blessed One responded: Arjuna, since the beginning of this world I have bestowed a two-fold devotion: the contemplative path wherein pure gnosis is emphasized, and the active path of service, effective through selfless action. Great verse that depicts the two-fold path of spiritual service: devotion for gnosis for those who are pure-contemplatives by nature (Jnana Yoga), and devotion to work for those whose spirit is strengthened through devoted and selfless action (Karma Yoga). This depicts the spiritual qualities of the yogin; indeed, some are pure-contemplatives (monastic-hermit types) whose karma is more gnosis-bent, and those, (like Arjuna), whose mission in life is to actively protect and propagate the Dharma. Yet, we shall soon discover that one way is not exclusive to the other; both contemplative AND active dimensions need to strike a harmonic chord in order to properly orchestrate the spiritual-yogic enterprise. As this chapter progresses we shall discover the meaning of actionless-action, known in Zen as Wu-hsin. 3.4 Yet, one cannot embrace spiritual freedom by escaping from activity; nor does one reach spiritual-perfection by outright rejection of actions. 3.5 Indeed, one cannot subsist in the world through inactivity; responsible action is the order of the day in order to procure Right Living. Even in the Contemplative Life one needs to procure certain actions that will assure success of the spiritual enterprise: activating daily meditation, caring for the body through good nutrition, daily hygiene and exercise, as well as continuous study for spiritual growth and edification. 3.6 If one’s body is frozen in zazen, yet one’s mind is still wandering and obsessed with sense objects, one is surely deluded and a hypocrite. Hence, the [action] of sitting in itself is not merited, but the fruit of the action which is deep-samadhis, provided that the mind is effectively quieted. 3.7 Indeed, quite merited is the one whose mind is in control over the senses; such a one is on the right foot to properly exercise Karma Yoga—the path of Right Spiritual Action. 3.8 So, be mindful of your prescribed duty. In light of this, responsible action is better than mindless inaction. Even your body would fail to perform if not reinforced daily through Right Action. This entry was posted in The Bhagavad Gita and tagged action, Arjuna, gnosis, Karma Yoga, Right Spiritual Action. Bookmark the permalink. 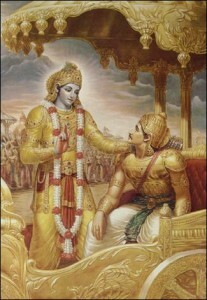 I would like to observe a teaching on this chapter from Swamini Atmaprakashananda, a well respected yogin and expert on Vedanta, to provide some perspective to Vajragoni’s excellent analysis: I think a Vedanta view is important because even though the Gita is unique, traditionally it cannot contradict the Upanishads, which Krisha refers to in guiding Arjuna in this chapter. She is firm that the path of the karma yogi prepares the yogin for Jnana Yoga. But this is of no account in my opinion because, as Vajragoni points out, ultimately the two yogas need to be integrated, with thought, word, and deed in alignment. This serene and integrated life leading to emanicpation is only possible through living according to dharma (i.e. “right views”). Karma yoga prepares the mind for knowledge. She goes on to say: “Ananda [limitlessness] is always there: all that’s needed is a mind that is sharp enough to recognise it.” This seems very relevant to Buddhism. This reminds me of what Tozen and some other sources refer to as signs of spiritual progress.